It’s likely that you’ve seen the HydraFacial MD® machine in the rooms at ReFresh, but we have never truly dug into what it does and how it can be a great addition to your routine. One of the biggest benefits of a HydraFacial MD® is that there’s no downtime. You can go back to work, attend an event and put makeup on all in the same day; truly within minutes of having your facial done. There is a pen-like tool used by your aesthetician in a matter of 30 minutes with three different steps that leave your skin feeling radiant and glowing. Cleanse and Peel: The first step in the process is to use a gentle exfoliant to uncover a new layer of skin. Then, a peel product is released into the pen and simultaneously drives into the skin and then is taken off the skin, so there is no recovery or downtime with the same results of a peel. Extract and Hydrate: As we stay with the nature of efficiency in this process, the pen tool then uses a gentle suction to extract any dirt and debris from your skin all while hydrating it at the same time. This allows for hydration to penetrate deep into the skin for results that truly last. Fuse and Protect: To maximize the appearance of your skin, the final step includes saturating the top layer of your face with antioxidants that lock in moisture and peptides to give that perfect glow. …then this easy, three-step process is perfect to add into your routine. This is also the perfect procedure to add into your schedule before a big event (like, say, a wedding). 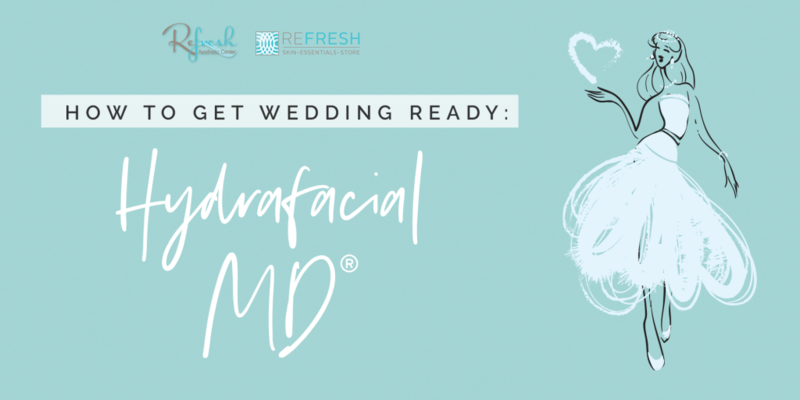 If you’re a bride, groom, mother of the bride, bridesmaid or attending a big event in the coming months, you can still maintain your busy schedule while improving your complexion with a HydraFacial MD® treatment. As the attendee of honor, you’ll want to do a series of facials three months out from the event, with the last one being a few weeks before. Get event or wedding ready with this quick, easy and effective treatment. As we mentioned before, there is zero downtime after this 30-minute procedure. You can put makeup on and go back to your daily activities as you would otherwise. You will see little to no redness on your skin. It is advised that if you can remain makeup-free and not wash your face just the night after a procedure; it allows for the product to penetrate deeper, but this is not necessary. If you can avoid excessive sweating the day of your procedure, this will help with product penetration as well. You can get a HydraFacial MD® as often as once a month, which your clinicians at ReFresh can help you decide with their completely personalized consultations at the beginning of every session. Let us know when you have an event scheduled, so we can get you event ready with great procedures like this! Ask us about the HydraFacial MD® next time you make an appointment at ReFresh!